Once the first day of autumn arrives, Halloween is just around the corner, and all those fun, frightening and festive decorations begin to appear as we decorate our homes for the season. So why not add some Halloween jewelry and/or accessories to our attire to carry the theme with us as we go about our everyday lives. Many years ago, my mother-in-law gave me a vintage spider pin that I have enjoyed wearing as the ‘big day’ approached. In fact, I have become so attached to the cute guy that he occasionally shows up whenever I need a great statement piece. Since I have enjoyed my spider pin so much, I decided that I would like to have more trinkets, so my quest began. Many necklaces, pins, earrings and bracelets that I found were colorful, but they were made of plastic. Not exactly what I had in mind, or what I wanted. While looking through a holiday book, I found the perfect necklace pattern. This is not my pattern, but I used the pattern in the book shown below to make my simple wire necklace skeleton. With the book in my hand, I visited a craft store to purchase the items that I would need. Once home, I called my daughter, and I told her I had a fun project for us to do and to come on over. Since All Hallows’ Eve is one of her favorite holidays, I knew she would enjoy our craft project. Since neither of us had ever made any jewelry and had no experience working with wire and beads, we were hesitant to begin, but begin we did. The instructions for the skeleton necklace are easy to read and understand, and they are simple to carry out. Within a short time, my daughter and I both had attractive and fun additions to our fall wardrobes. As shown in the picture, I threaded a ribbon through the top loop of my necklace to hang it around my neck. My daughter hung her skeleton on a silver chain, which gave it a dressier look. 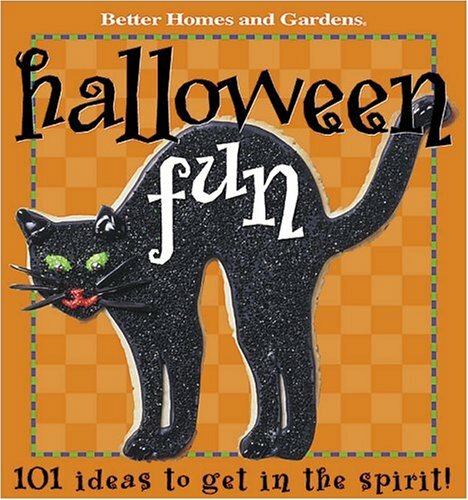 This Better Homes and Gardens Halloween Fun Book has some spook-tacular ideas for making Halloween more fun. Again, this is not my pattern, but it is one that I found online. This quick and easy crocheted necklace will add fun to any outfit. Since it only needs a small amount of yarn, you might even have the supplies you will need already in your yarn stash. The pattern is so easy, someone who is just learning to crochet can make it to practice his or her stitches. Another plus is the necklace makes up quickly. NOTE: I made some minor changes to the pattern, such as, changing the color of the necklace chain yarn, and I made my ghost flat instead of in the round. I made them flat because I will be adding some witches’ hats and candy corn to the necklace next year. 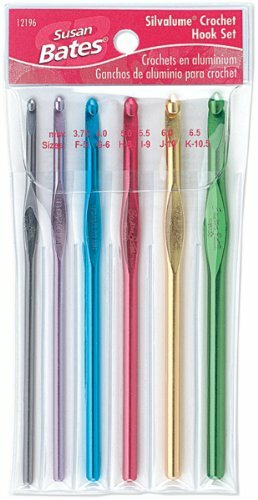 This set of Susan Bates Silvalume Crochet Hooks offers some of the most popular sizes for many crocheting projects. This set will make a great addition to your crafting supplies. The above Halloween easy crafts projects are memorable ways to spend time with family and/or friends while making something fun to wear. These spook-tacular necklaces would also make a cute gift(s) and/or be a welcome money making addition to fall festivals and fairs. I hope this article will inspire you to have some fun making Halloween jewelry.